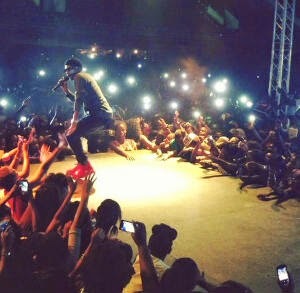 On Saturday February 28, Nigerian superstar Wizkid headlined the 50th independence anniversary celebrations of Gambia where he performed to a capacity crowd at the Independence Stadium in Bakau. After the performance, Wizkid shared a couple of Instagram videos on his page which show the crowd very excited with his presence and songs. Now, the singer has gone a step further by sharing a picture of himself with the President of Gambia, Yahya Jammeh.